96 Trans AM, A Good Price? A local guy has a 96 TA 6-speed up for sale. Its has a cam, headers, exhaust, and new clutch. It does need some TLC . Paint is not the best (clear coat), and the interior needs some work. Window motors are toast, and missing the switch panel on the driver's side door panel. The seats are in good shape. It drove pretty well, engine runs really strong with good oil pressure. The trans has a slight grind into 3rd and 4th, when shifting hard. Guy wants 2k for it. Price reasonable?I don't know what LT1 cars are going for these days. I haven't had a f-body for about 9 years now, due to family stuff. I'm thinking it would be a nice project car to play with. Last edited by seawolf18; 02-14-2019 at 09:10 PM. Paint is not the best (clear coat), - If you're seriously interested I would run the VIN through Carfax or Autocheck because the car may have an accident history based on the front end and poor panel alignment in this picture. Depending on details that may not matter. Hitting a deer can easily do a lot of cosmetic damage etc. Sometimes clear coat issues can be repaired by professional paint correction. Easily $500 to $1000 plus ceramic coating to protect going forward. the interior needs some work. Window motors are toast, and missing the switch panel on the driver's side door panel. The seats are in good shape. Does AC work? Heat? Is dash cracked? They are expensive to replace. $100 -$125 for power window motors and switch. Do headlight motors work? Easily another $100 each. The trans has a slight grind into 3rd and 4th, when shifting hard. Could be synconizers, t56 gears or pilot bearing . T56 master rebuild kits start around $600 if you can pull and rebuild yourself. Add roughly $350 to pull it and $400 to rebuild if a shop does it. Might as well go through the transmission while it's out. Guy wants 2k for it. Price reasonable? Are the tires in good condition? Easily $300 for cheap Walmart tires if the car needs them. $125 + per tire for decent tires. $2000 asking for car, he might take $1800, tax tag title your probably at $2000. Know issues - $1000 for paint correction and ceramic coating, $125 in switches, $1,500 or so T56 rebuild. Probably $500 in oil change, filter, new transmission fluid, radiator flush, brake flush, change rear differential fluid, air filter etc. Buying car is really just the first payment, maintenance is the 2nd payment and repairs are the third payment. How many miles on car? I think you could find a better car than this one with some time searching. It's very likely there are a few other issues that will cost some cash. Finding parts, especially interior ones for 20-24 year old cars can be way more annoying now than ten years ago for these cars. I've had my 99 TA since 1999 and have noticed the changes in it. A lot of stuff isn't in reproduction yet. My 02 Z28 need new hinges for the rear hatch managed to find a set of used ones from Hawk's Motorsports. I would want to have at least $3000 in cash on hand for repairs beyond the cost of this car. If life circumstances allow spending the funds on the car and you like it, nothing wrong with getting the car as a project provided you know what your getting into with this project. My x-wife hated cars like this one. My fiance greatly dislikes project cars. I would be absolutely sure the significant other is supportive of a project car and it's expected cost. I see what you are saying about the front, I'm in in one of the highest deer strike states. Title is clean, no salvage or damage disclosers on it. I can do the transmission myself. Tires have a lot of tread on them. It has aftermarket wheels with 315's in the back and 275's in the front, Z rated tires on it. The car has 154,000 miles on it. The A/C does not work, the heat does. Headlight motors are good. The other half doesn't care about a project, as long as she can still park her Impala in the garage. Its also not rusty, a big thing up here. I have been approaching it as a project, and I know from past experience stuff always pops up. This is something for my son and I to do\work on during the long winters. My son will already be driving age in about 3 years . Hes starting to get into cars, and I want to expose him to some of the great times when I had my 02 Z/28, in my younger days. Expose him to American v8 powered cars, before an Import fan boy corrupts him, . I'm probably going to call the guy and shoot him an offer on it. A running/driving v8 6-speed 4th gen for under $2,000 is kinda a unicorn in my neck of the woods. People are asking what I think is ridiculous prices for them, but then I don't know what they are selling for, or if they are selling them. Thank you for the replay. Quality time with your son for $2000 is priceless. You don't even need the car. It's a plus. Despite the lousy condition, Get it!!! SeaWolf, go for it given you can do the transmission yourself. The other stuff would be well within your ability. Good tires, nice rims - big plus. Clean title, no accidents, no rust - all big positives. The car should make an excellent father & son project. There are definitely some stupid prices on 4th Gen's out there. 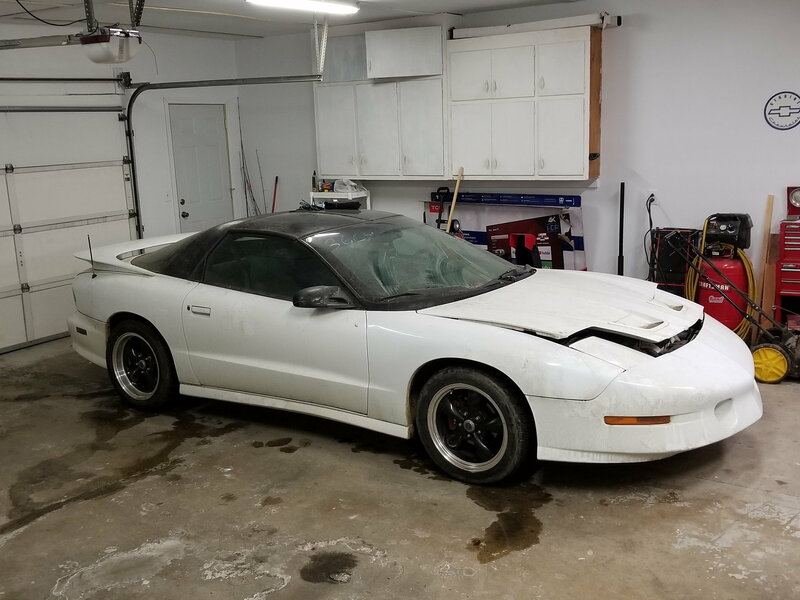 "99 Z28, roller needs engine, could use paint, $4,500 FIRM - I know what I've got!!!" I called the guy, and picked it up for $1,800. Hes all excited about it. Now we'll see what we really got our self's into. It looks nice with those wheels. Fix that bumper and hood and it will look nice. SeaWolf, Sweet! Welcome back to the 4th Gen LT1/LS1 community. I hope you do a build thread for the car in the Firebird forum would be really cool to see the details..
Best wishes on car and father-son project! SeaWolf, I hope you do a build thread for the car in the Firebird forum would be really cool to see the details..